Here I sit, working an overnight job, with the available time to write. How great is that. I’m caring for an elderly gentleman, simply being nearby in case he needs anything through the night. For those who may have read my earlier posts of a month ago, I was finished doing my companion care employment. Turns out I’m working again. 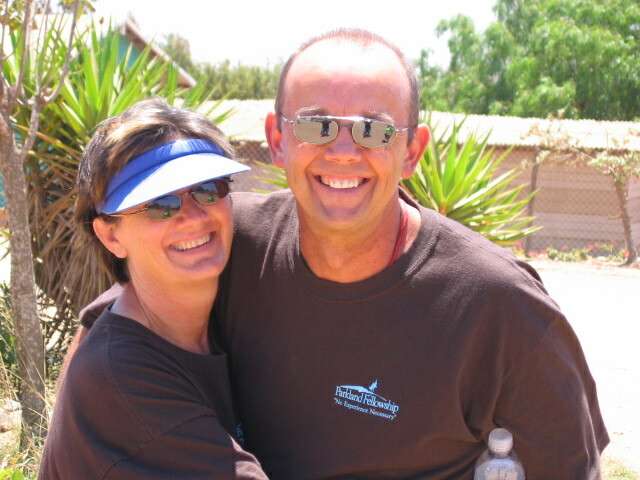 The photo above was taken while on a missions trip to Mexico in 2005. My husband Ross and I were with a team of approx 50 people and it was a whirlwind of activity. Since then I ended up in the same location several more times. I love the photo, the memories it stirs up of fun, sun, closeness, companionship, love, grief, sadness for others, shared experience and hardship. It all added up to joy. Serving. Giving. I’ve been in the restless stage of life, at least for me it is restless. I am seeking to link in a lot of loose ends of my life such as writing, painting (art/creativity), volunteering with Freedom Session – a 12 step faith based healing/discipleship/recovery ministry, keep growing as a woman – education/new job/new activities, etc….and then call it all a career. Perhaps I simply need to call it my life. But, here I am, past midnight getting all excited about so many possibilities of things to do (though by 7 tomorrow morning all I will want to do is hop into my bed) However, in all the planning (thinking) I’ve discovered there are a couple significant events taking place this year. This is amazing to me because I seem unable to relate to that fact. I just got used to saying I was 50, then admitting I was 55 and now suddenly 4 more years have passed me by. Then to top it off, I’ve been married nearly 34 years – how does that happen?